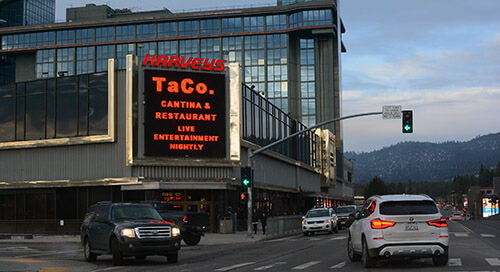 Get down at Harveys Tahoe: The party continues at TaCo. The entire TaCo. staff was retained as the well-know downstairs restaurant and music spot at Harveys Lake Tahoe transitioned in November from the Cabo Wabo Cantina. Cabo Wabo is now Tahoe’s TaCo. If that twists your tongue, it can be loosened with a margarita – they’re pretty strong. The Stateline Casino Corridor’s best-known subterranean Mexican restaurant and late-night music hub is redefined. After 14 years, the venue has changed to TaCo. For music lovers, there’s a new sound system, new lasers and stage lights. Beginning at 10 p.m., there is live music on Fridays and Saturdays, DJs on Thursdays and Sundays (service industry night) and Tuesdays, which is Latino Night. TaCo. has an increased emphasis on bringing local artists. “Cabo Wabo was known for nightlife and we want to be known for nightlife as well,” said General Manger James Redlark, who knows Lake Tahoe’s history as well as anyone. He grew up on the Nevada side and went to Whittell High School in Zephyr Cove. Each of the employees were retained during the transition; in fact, two were added. The menu is larger, too, with more tacos to choose from and a 1-pound-plus tri-tip for two. The kitchen opens at 4 p.m. on weekdays, noon on weekends. 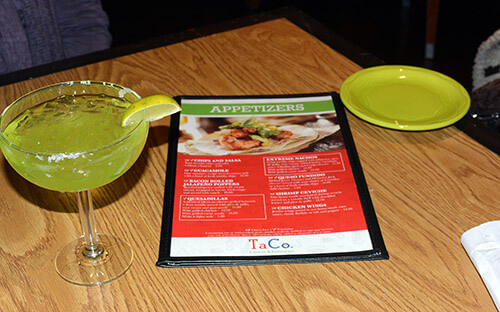 About those margaritas: There’s a variety of tequilas seven different blends, some named after songs, including one that has Herradura Silver tequila and Midori liqueur. It’s called Season of the Witch, and drinking one will make you want to dust your broom like Elmore James. The music goes at least until 1 a.m., except on Saturday night when it’s 3 a.m. Sunday. However, as long as people are there the music will continue to play. TaCo. is located beneath Harveys Casino, and across downstairs hallway from Harrah’s Lake Tahoe. Harveys Outdoor Arena is the site for 12-to-18 summertime shows a year. After-party bands will play at TaCo. after each concert. Customers can ponder the menu with a salted Season of the Witch margarita.